We all know that sports like football are an integral part of the fabric that makes up America, but did you know that it was football that forever changed the way we watch sports on television? It all started with Monday Night Football in the ‘70s. During the early 1960s, NFL Commissioner Pete Rozelle envisioned the possibility of playing at least one game weekly during prime time that could be viewed by a greater television audience. It took years to make it happen, but in 1970, he finally inked a deal with ABC to make Monday Night Football a reality. After that contract was signed, ABC Sports producer Roone Arledge immediately saw possibilities for the new program, and set out to create an entertainment "spectacle" as much as a simple sports broadcast. It worked: Combining player interviews, entertaining commentary (hot trivia tip: Monday Night Football expanded the regular two-man broadcasting booth to three), celebrity appearances, twice the usual number of cameras to cover the game, extensive graphic design within the show, and instant replay, Monday Night Football turned watching football into appointment television for the whole family. 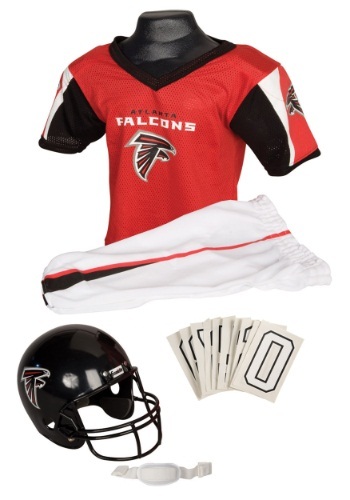 And now, whether they're watching football on Monday night or going to the game, your child can score their very own touchdown by representing their favorite NFL team player with this NFL Falcons Uniform Costume! The mesh jersey has the ''Falcons'' name & logo printed on front, and the jersey is blank for iron-on numbers...which means your child gets to choose exactly who they wanna root for when they wear it! The red and black striped pants also have an elastic waist and cuffs, and it even comes with a Falcons helmet. Which leaves only one thing left to ask: Are you ready for some football?